For starters, in case you’re unsure, it reads “tay-shoh-kooh” and it is a basic Japanese meal with several dishes. 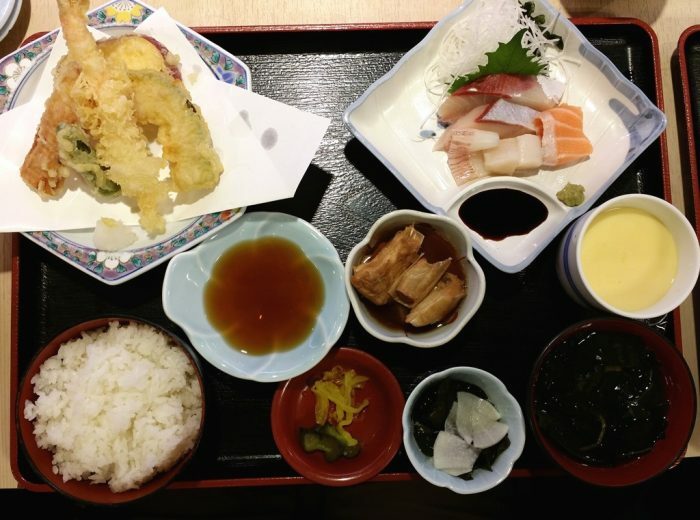 You can eat teishoku in some restaurants, as well as at home, if the person doing the cooking is in the mood to prepare a bunch of different dishes. In other words, that’s more or less your typical Japanese “full meal”. Tempura: lightly deep-fried (i.e. not gross like in the US) food items: fish, shrimp, okra, slice of pumpkin, slice of sweet potato and chikuwa. Sashimi: here, salmon, scallops, cuttlefish and hamachi (Japanese amberjack or yellowtail, probably one of my favorite fish to eat as sashimi). “Ara no nitsuke”: pieces of fish that can’t be used for sashimi or other “nicer” dishes, and that are simmered. Chawanmushi: a typical Japanese custard that is not sweet but on the contrary salty and that contains various types of food (shrimp, gingko, mushrooms, etc). Tsukemono (literally: “pickled things”). That can be eaten as is or on the rice. Seaweed and daikon (Japanese radish) salad. If you visit Japan, make sure you eat a Teishoku at least once during your trip.